Using a slow cooker has been my way of meal prepping. I will make two slow cooker meals a week which will last me from Monday to Friday for both lunch and dinner. Making quinoa is perfect for meal prepping because a little goes a long way. One cup of quinoa will last me two days. Of course, I’m not eating quinoa plain. I’m including it as part of a recipe such as this month’s recipe, a cheesy enchilada quinoa bowl. This is a spicy, protein-packed meal that satisfies. It is healthy but the cream cheese and shredded cheese make it so enjoyable. 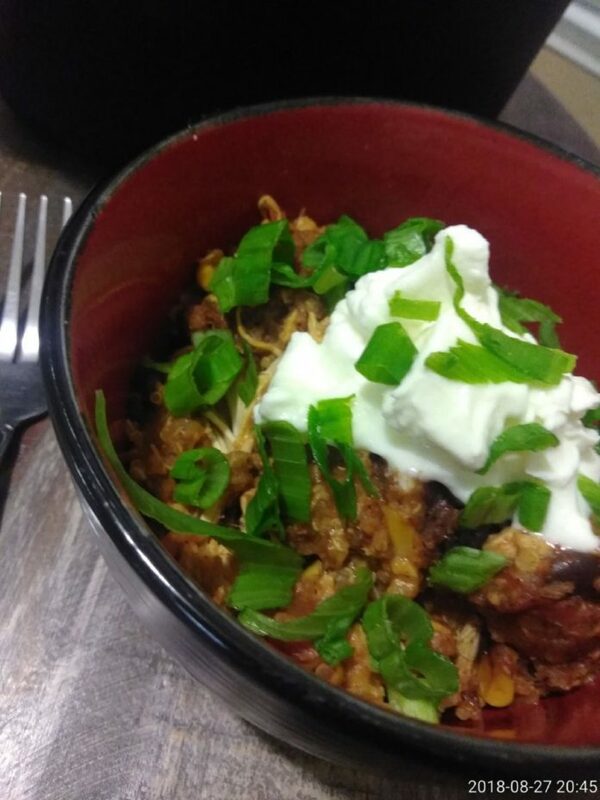 The recipe also includes black beans, shredded chicken, corn, onion, diced tomatoes with green chilies, enchilada sauce and spices (salt, pepper, cumin and garlic powder). The recipe didn’t call for chicken. I added it myself. I’ll be honest; I didn’t want to cook the chicken so I bought pre-cooked shredded chicken at H-E-B. I added the chicken two hours into the cooking process. I tend to enjoy my food spicy. When I purchased the enchilada sauce and the tomatoes with green chilies, I bought them hot-flavored. This is a recipe in which you let the slow cooker do all the work. You mix all of the ingredients in the slow cooker and let it cook on high for 3 1/2 hours. You can top off your quinoa bowl with green onions, avocado slices, cilantro or low-fat sour cream. Basically, you can add what you want to it. >> Add beans, 1 can of enchilada sauce, diced tomatoes and chilies, quinoa, water, cream cheese, spices to slow cooker. Stir all the ingredients. >> Pour in remaining can of enchilada sauce and then add the shredded cheese. >> Serve and add garnishes.